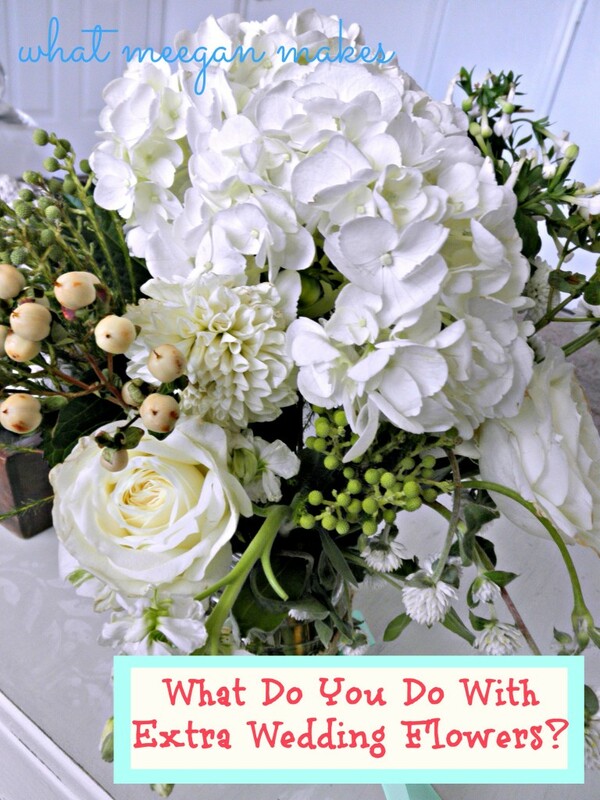 What Do You Do With Extra Wedding Flowers? 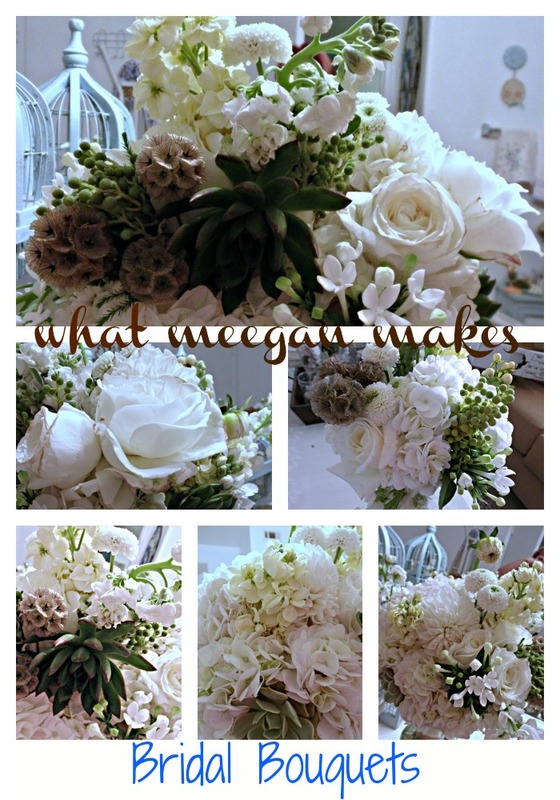 Last week I promised I would share more of the bridal flowers I did for a wedding a few weeks ago. I am excited to share those with you today. 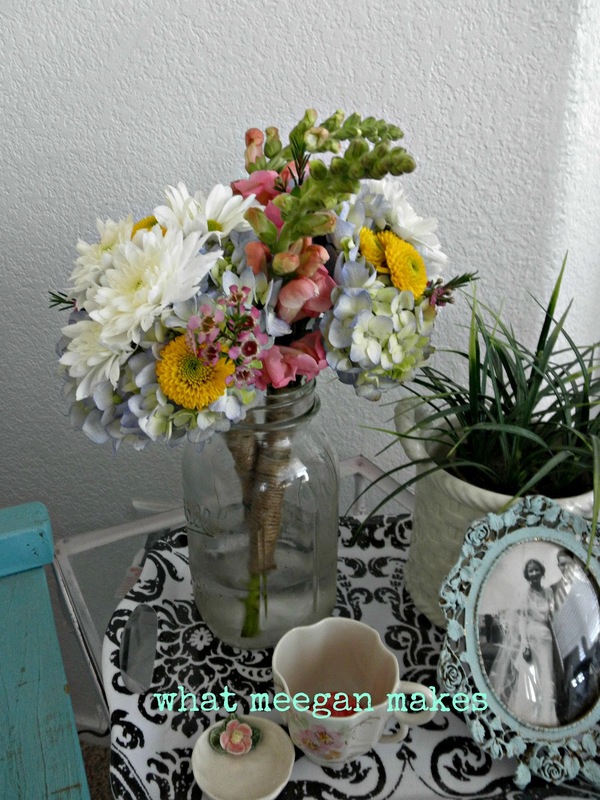 So what do you do with extra wedding flowers? Hmmm…That is a really good question. And I actually have an answer for you! 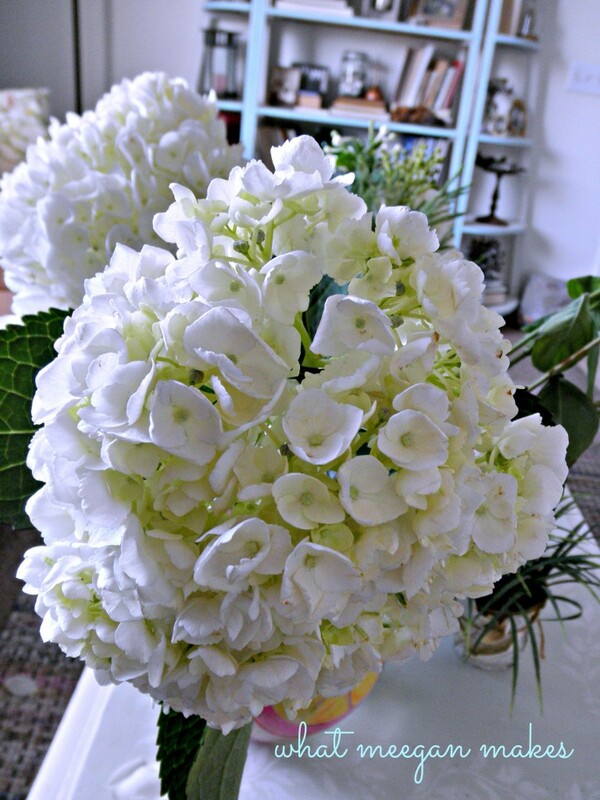 I gathered the extra white hydrangeas. Then I gathered every berry and fern I had left over. I like to use several types of berries and ferns. They add variety and even more texture. I also gathered as many unusual flowers that were extras. I like using flowers that are out of the ordinary, and not typical. This flower reminds me of a stephanotis. (One of my favorite flowers) And it smells SO sweet! 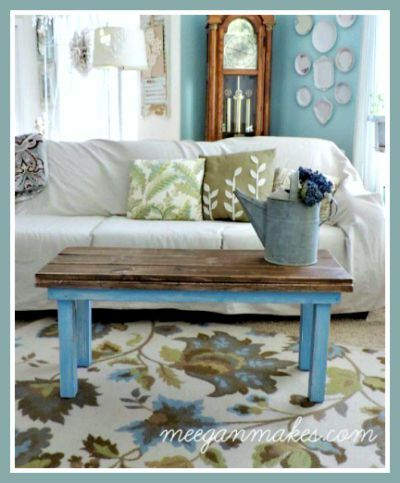 I gathered anything that had texture and a little added color would be just right for my idea. And of course, a Garden Rose will be perfect, as well. Aren’t all of these flowers looking amazing? 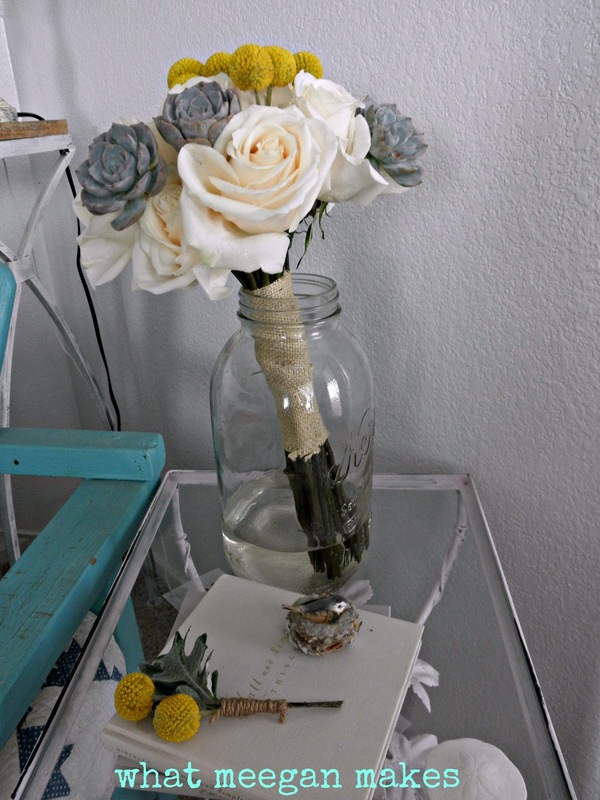 They are just what I need for the idea I have for all of the extra wedding flowers. 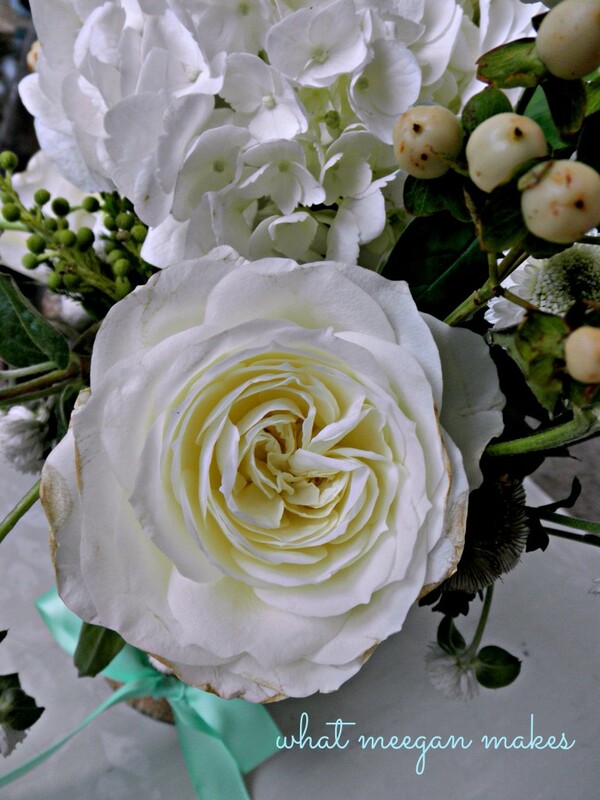 I love Garden Roses. Have you ever purchased them? They are different than other roses. The scent is like picking a rose right out of the garden. When ordering them, ask specifically for Garden Roses. They will cost more-but worth every penny. I know the edges are brown. 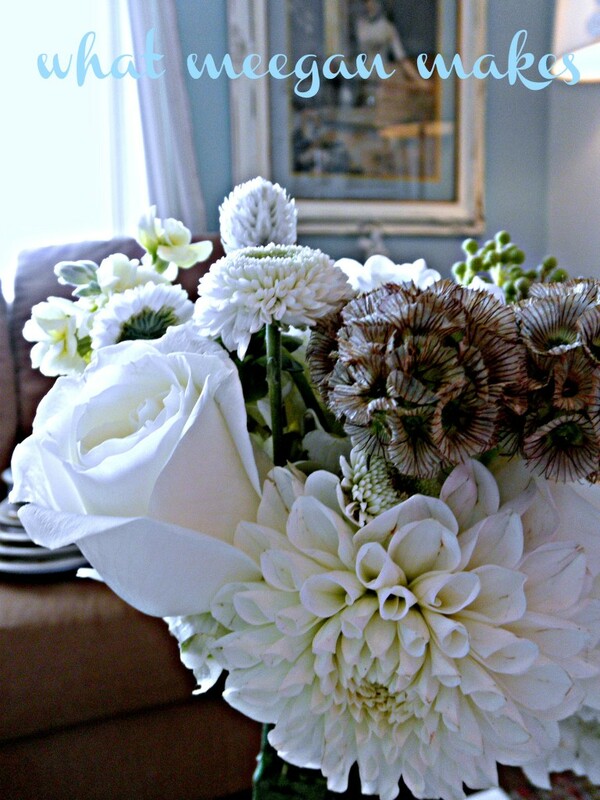 But, if you remember from my bridal flower post last week, I leave the brown petals on until the very last minute. Then the flowers look as fresh as possible. Once I was done gathering all of my extras, I used an old pickle jar, wrapped it with burlap and tied it with the wedding color ribbon. Perfect. It looks like a centerpiece, doesn’t it? It is pretty enough to be one, right? But, it isn’t a centerpiece at all. I only make one for every wedding I have worked on. Can you guess where it goes? It has a special place all it’s own. Yep, I place it in the bathroom. 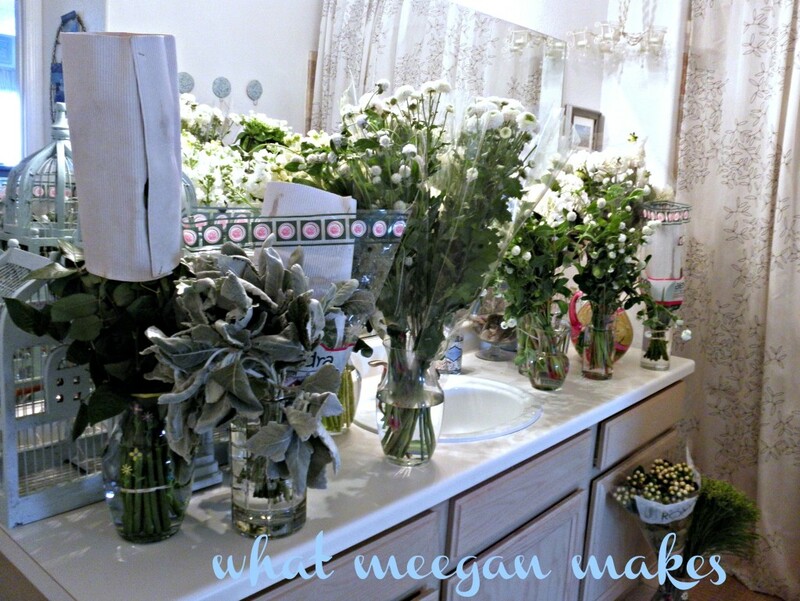 I think it is so fun to have fresh flowers from the wedding party in the bathroom. 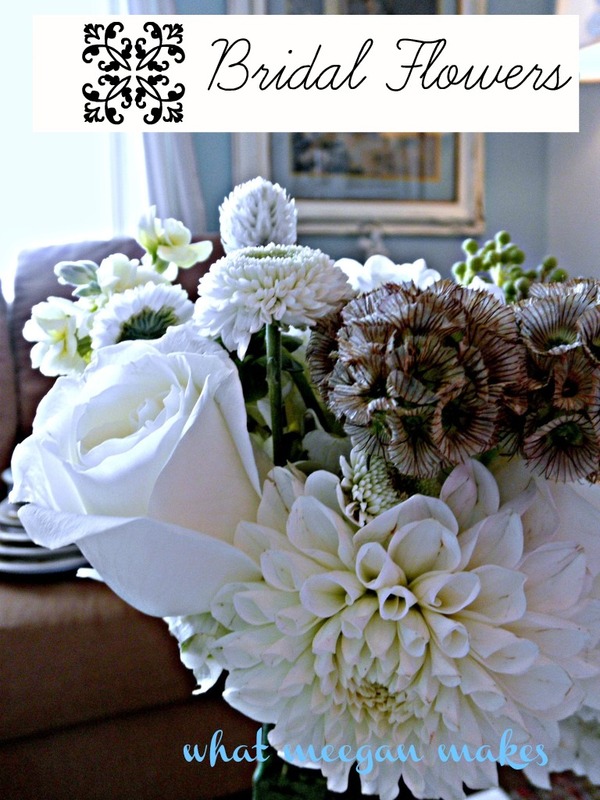 It is inviting, it’s classy, and who doesn’t like fresh flowers in EVERY room? This way each area of the wedding is covered with a portion of what is going on out in the reception area. 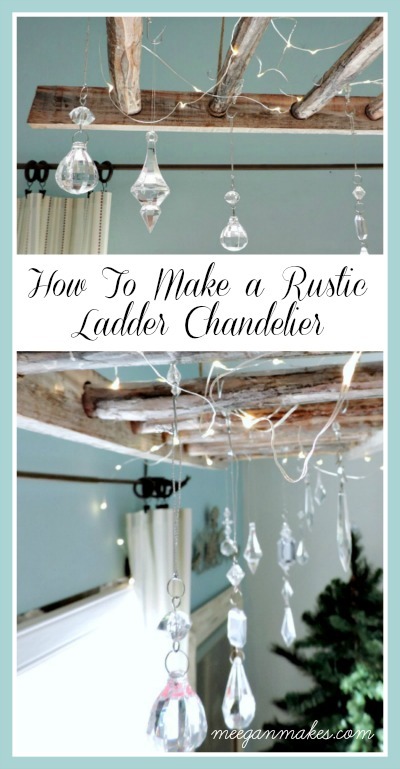 I have always loved this idea. It’s like a special gift for the guests. 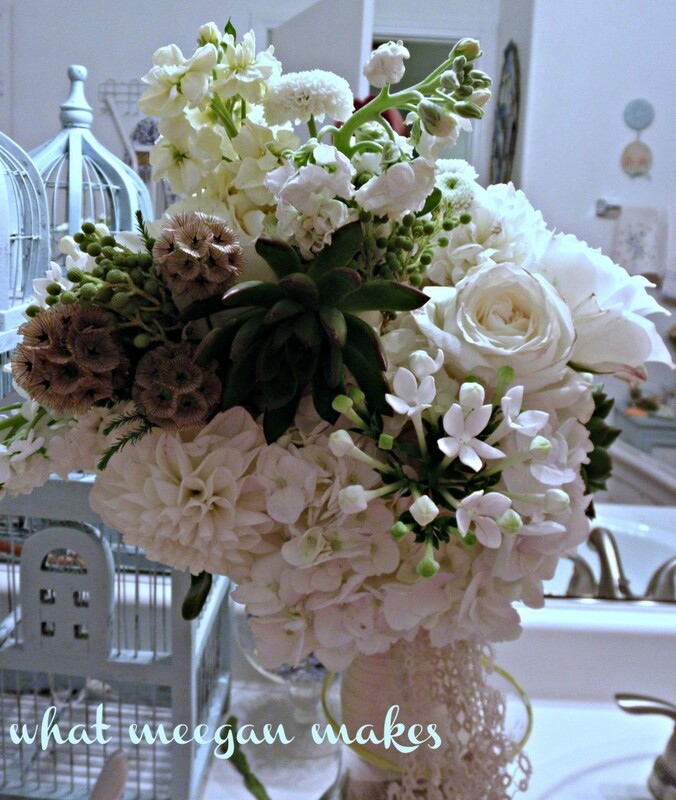 I am so happy you came by today to see what you do with extra wedding flowers. I hope you will do the same for some of your family or friends when they get married. I would love for you to leave me a comment and let me know what you think. 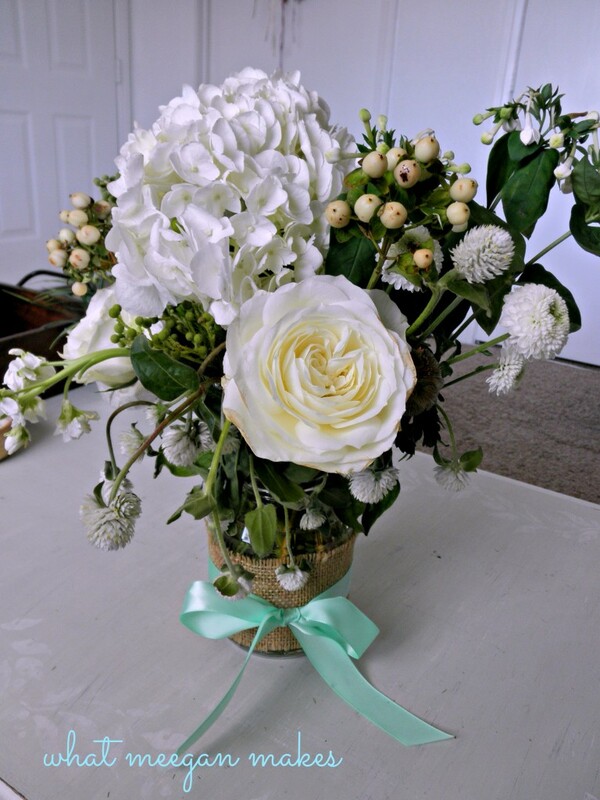 Now you will never need to ask “What do you do with extra wedding flowers?” You will have the perfect answer. Thanks for joining me today! 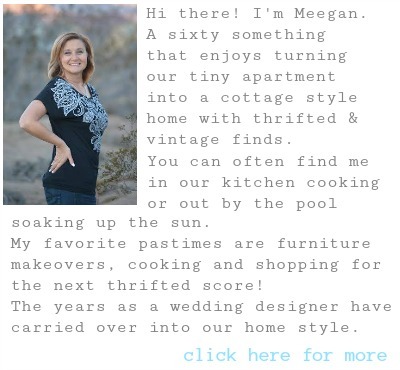 I love having you here and following me on: Pinterest Facebook Hometalk Google+ Stumble Upon Bloglovin’ twitter Instagram Join me here soon, too! I really haven’t been doing bridal flowers for very long. 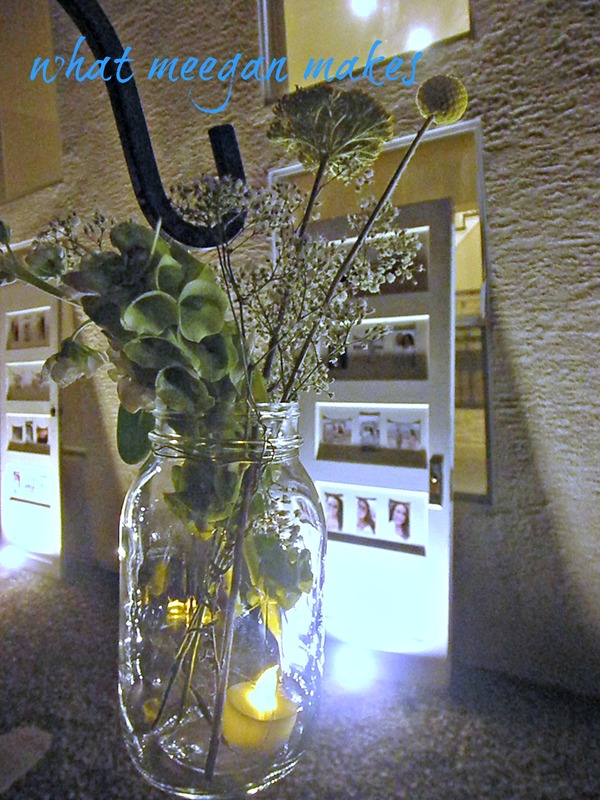 My first interest and duty was to decorate for weddings and/or receptions. 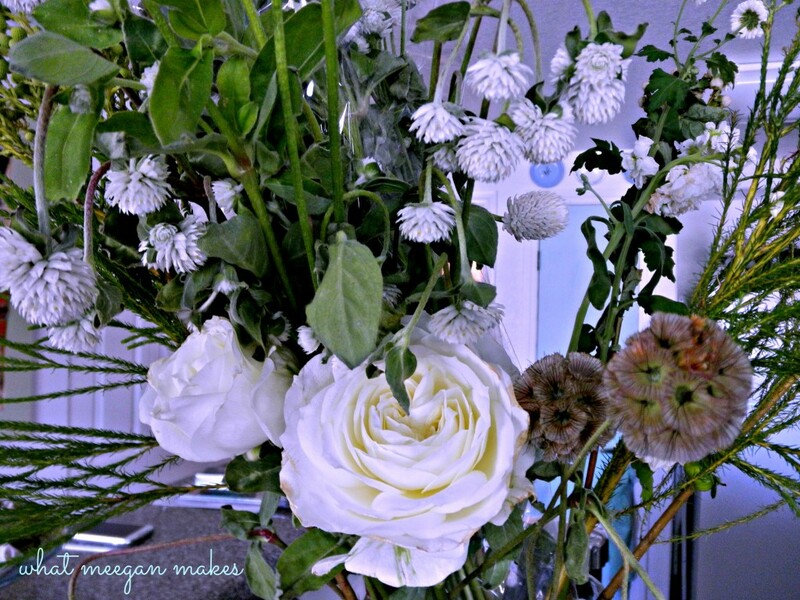 Through watching and learning from my sweet friend, Wendy (she was my maid of honor when we got married), I moved on to doing the bridal flowers and bouquets. 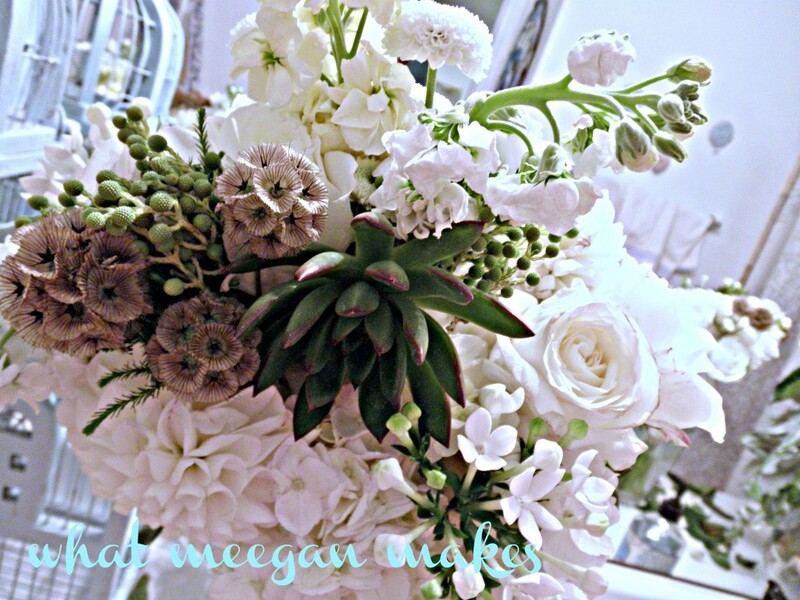 I learned to work with several types of flowers, Each is unique in their care prior to the placement in the bouquet. 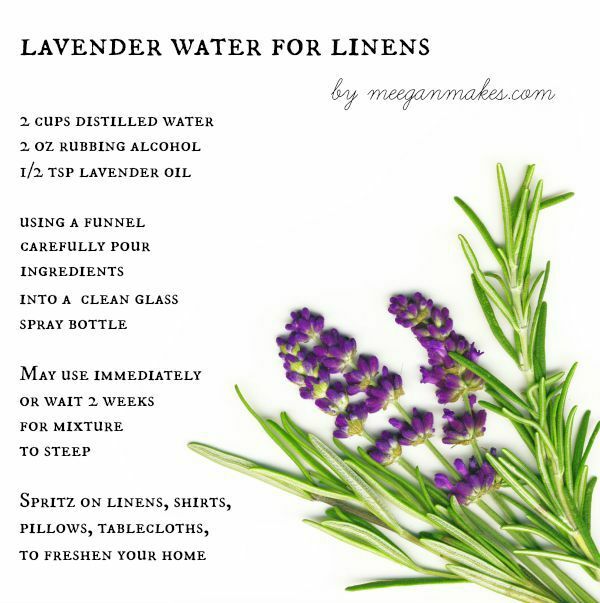 For more tips on floral care on my blog visit here. Styles change, and each bride has their own vision of what their bouquet should look like. Sometimes it’s a challenge. But, my goal is to make that happen. I would have to say my most recent love to work with would be succulents. They are hearty, but very delicate. Their root is so strong, but the petals could end up falling apart in your hands while you are working. People ask me all the time if it takes a long time to make bridal bouquets. My answer is: Yes, it does. You wire the flowers, place them where you want them, and wrap them with floral tape for security. If it isn’t what you want or picture, you unwrap them and start again. Sometimes again and again. 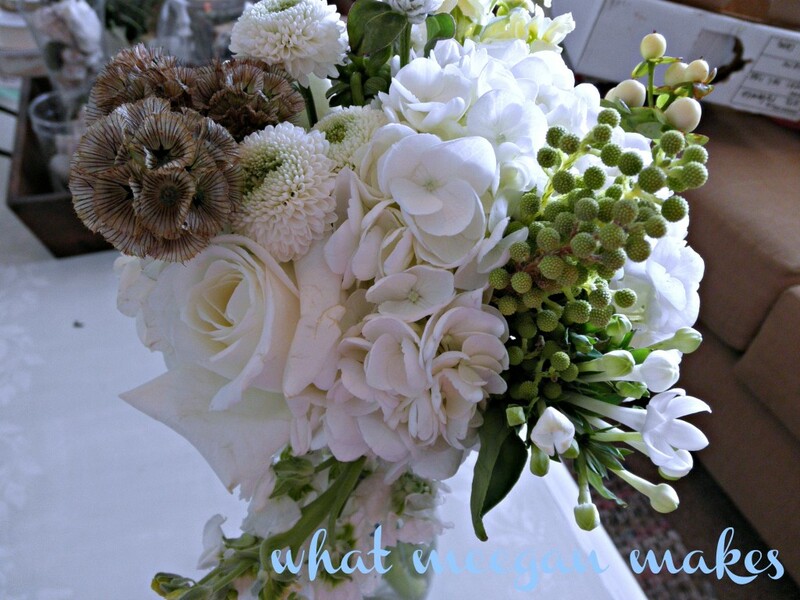 I love, love, love the variety of flowers for this bouquet. It was vintage and trendy at the same time. 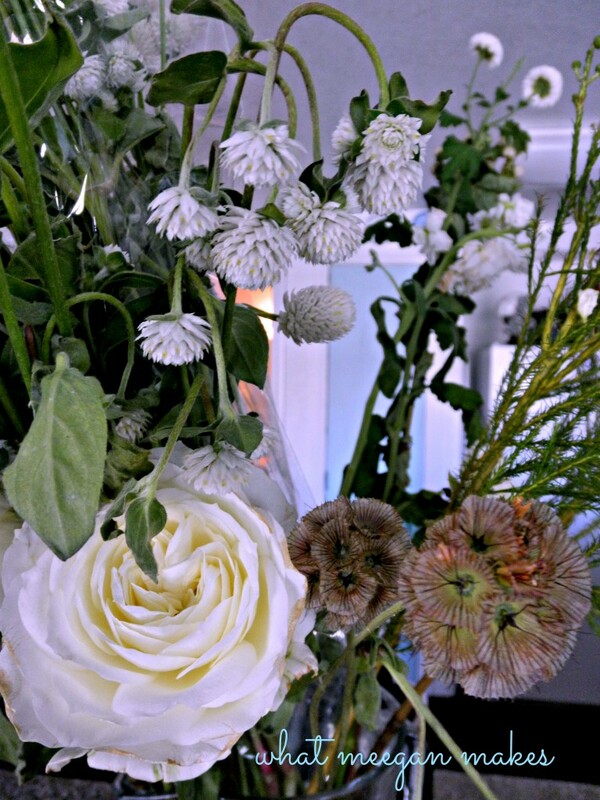 I hope you have enjoyed my weekend bridal flowers today. It was a beautiful wedding with many other flowers that I will share with you later in the week. 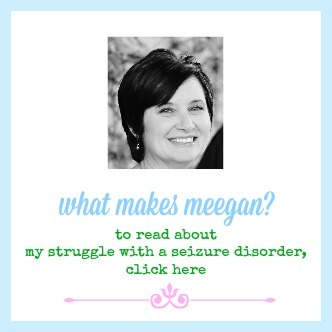 Thanks for stopping by today and joining me on my blog. It is always a pleasure to have you here! 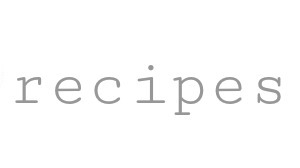 I share little bits and pieces of my blog and life on: Pinterest Facebook Hometalk Google + Stumble Upon Bloglovin’ twitter Instagram Join me here soon, too! 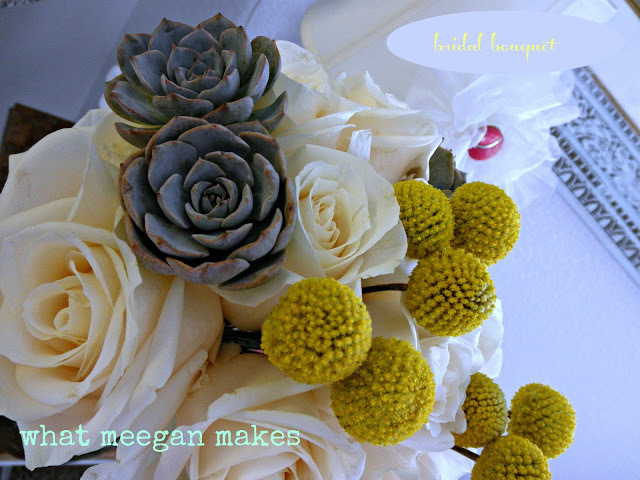 The Best of What Meegan Makes 2012-Bridal Bouquet is featured today!! 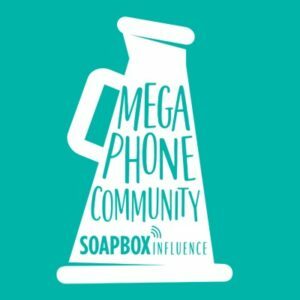 I am excited to share this post with you. Not only because of the positive response I got, but because it has been a few years since I have done flowers-and I was so pleased with how they turned out. Enjoy!! These colors came out looking so well together. 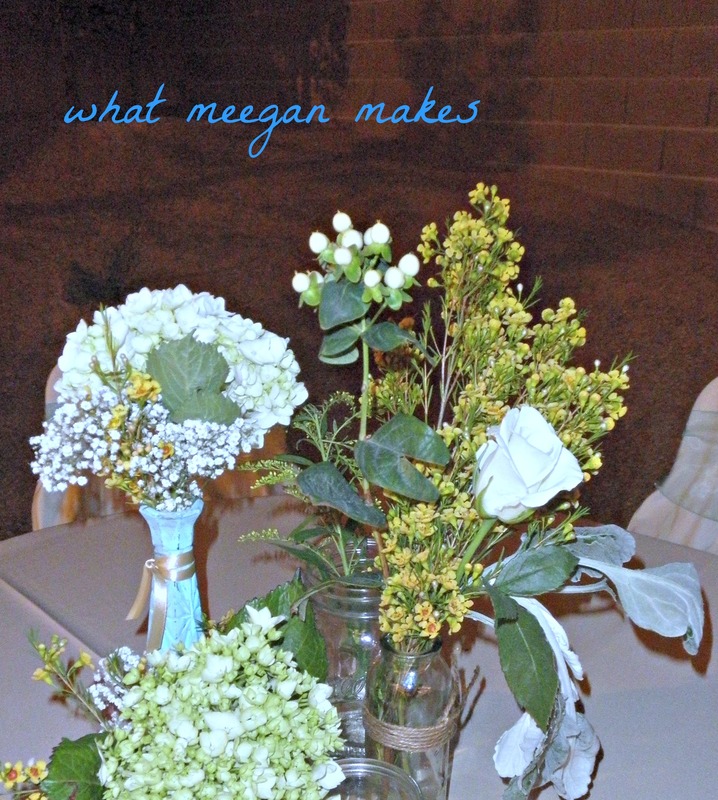 This is a few bridesmaid’s bouquets. Gotta love me some blue hydrangeas!! Today another bride is taking her Bridal Portraits and wanted her bouquet for the sitting. She likes roses, succulents, and billy balls. Her wedding colors are champagne, taupe, peachy pink, creamy whites, gray and white. This is almost done-I added another single succulent towards the bottom. 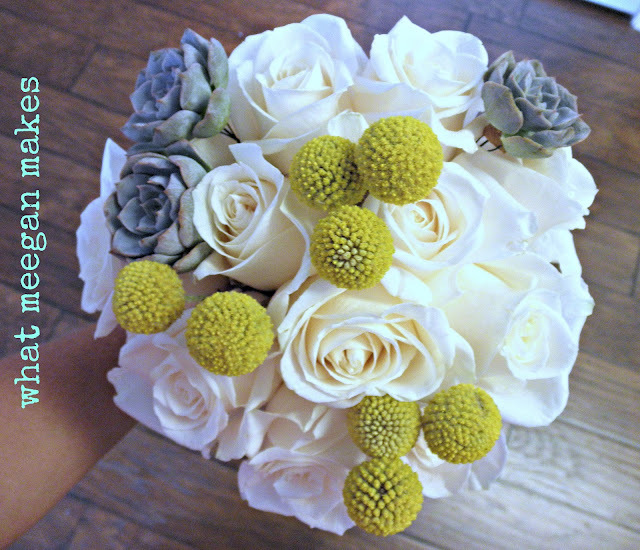 Here are both the Groom’s boutonniere and the Bridal bouquet. I would love to show you a full view, but that is for the bride to do. 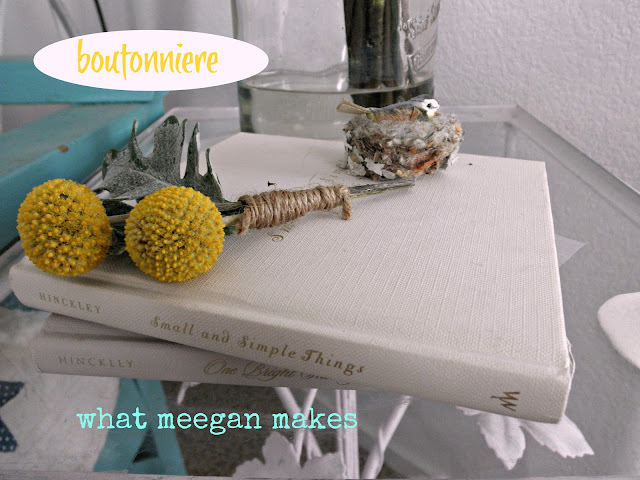 The “bout” is 2 yellow billy balls and 2 dusty miller leaves. I wrapped the stems with twine. 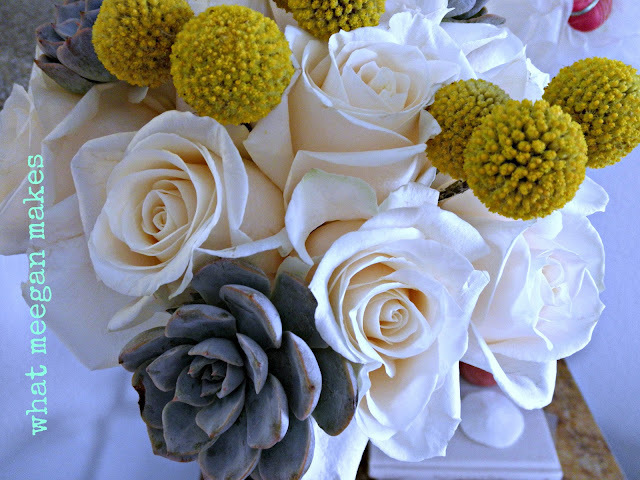 The dusty miller leaves are the same shade as the succulents, so it works well. They are also a heavier leaf, like the succulents. I used the leaves for balance. 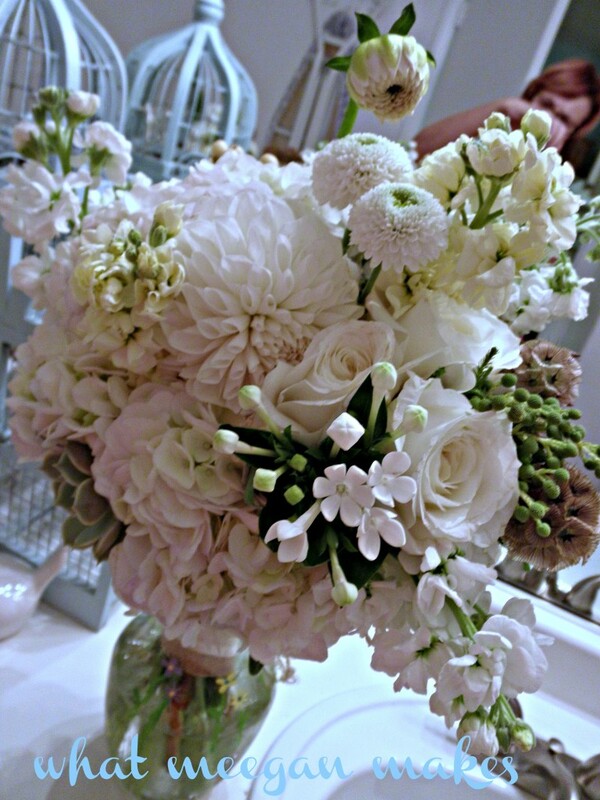 The Bridal bouquet. There are so many textures. I really like it. She needed a gray succulent, rather than green. I actually bought these at our local nursery in tiny pots. They work perfectly!! 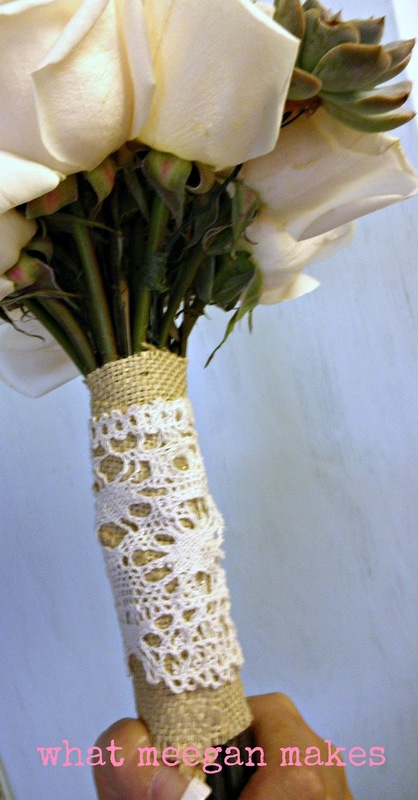 I added vintage lace around the burlap for even more texture and style. The lace is some of my Grandma’s lace. I know she would love seeing it wrapped around a bridal bouquet. These pictures make me smile! I hope they bring a smile to your face as well!! Their wedding is towards the end of September, so I am sure I will have more pictures for you then!! 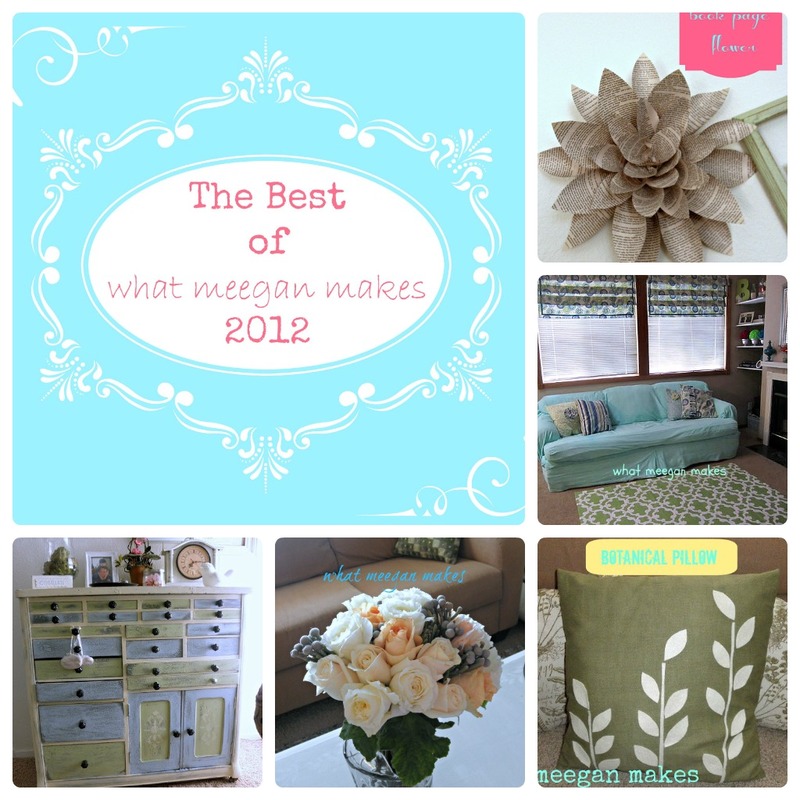 Thanks for stopping by and giving me some blog love!! I love to have you here! My last Best of 2012 will be posted tomorrow. Hmmm…I wonder what it will be!! 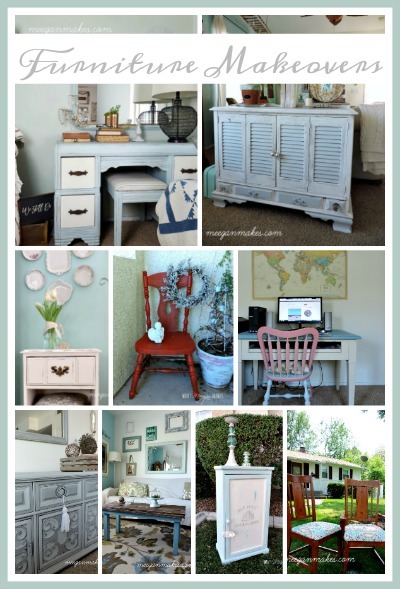 Be sure to stop by later today for “My Friday Fave Pins”!! To follow me by email, just below the comments check the box that says, “Notify me of new posts by email”. Simple!! 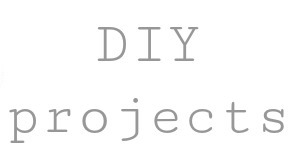 This post will be linked to some of my fave parties on my blog roll. 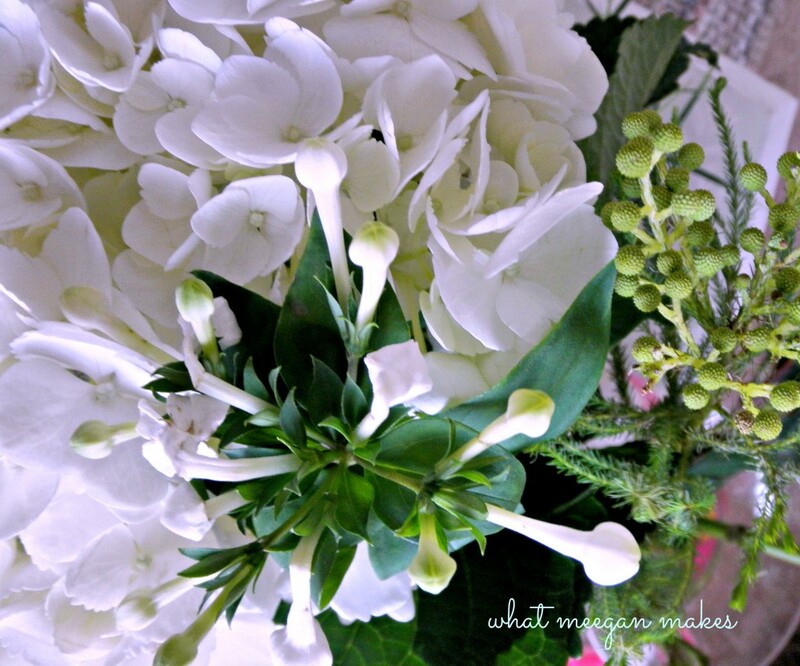 Last week I shared with you the bridal flowersI did for my sweet friend. I still have a few more pictures I would like to share with you. This wedding was so much fun. 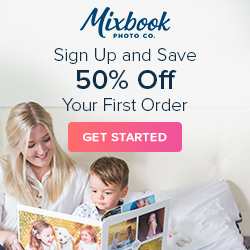 The bride knew exactly what she wanted, that made it so easy and fun!! 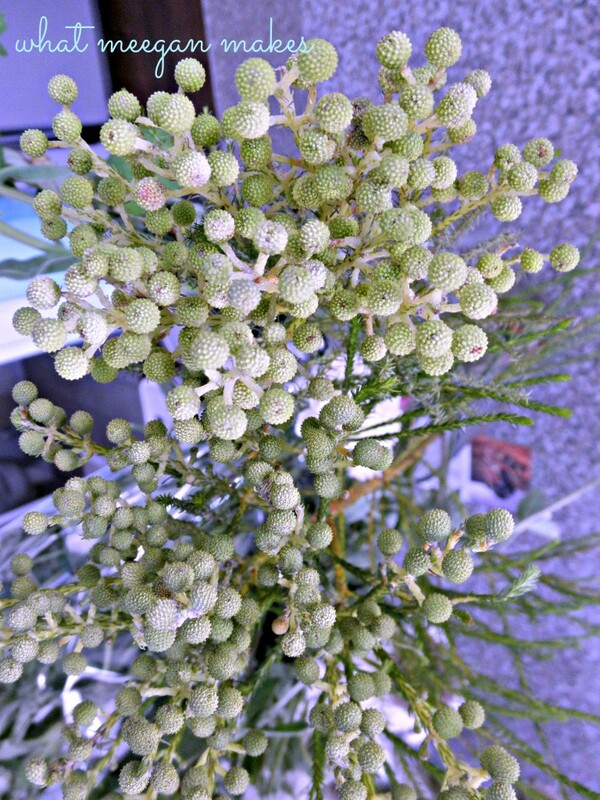 We purchased several different kinds of flowers, berries and leaves with different textures and colors. We decided on 3 types of tablescapes, since there were 23 tables. 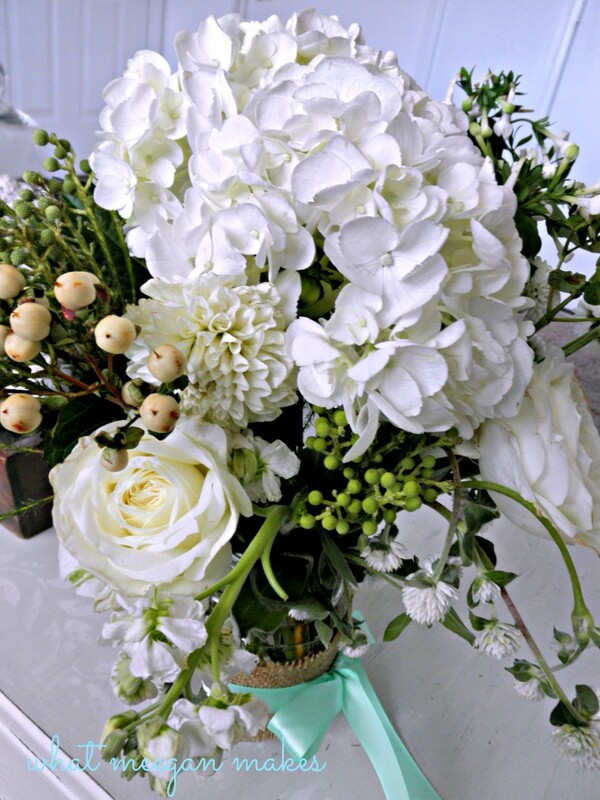 We could mix and match flowers and tablescapes, so not one table would be the same. LOVE it!! This particular table was all vases and jars at different levels. 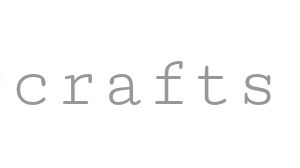 Each vase or jar was wrapped with twine or ribbon coordinating with her colors. 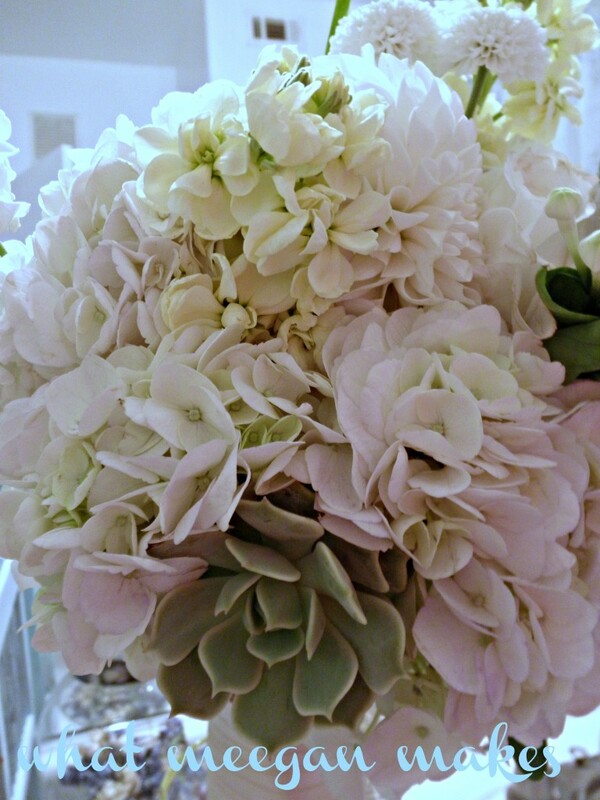 Don’t you just love hydrangeas?? The leaves are Dusty Miller. 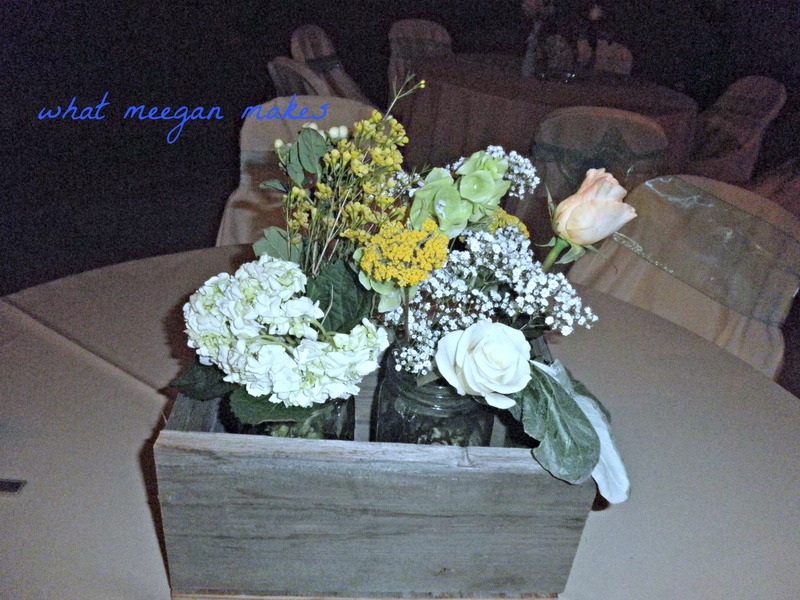 The wooden boxes were made by her fiancée with barn wood from his grandpa!! Love the wood!! 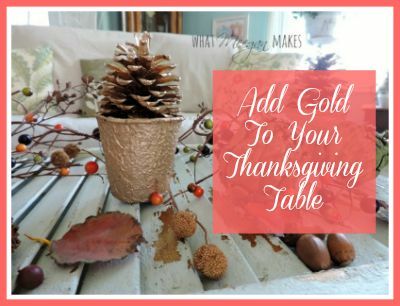 It adds some dimension to each table. 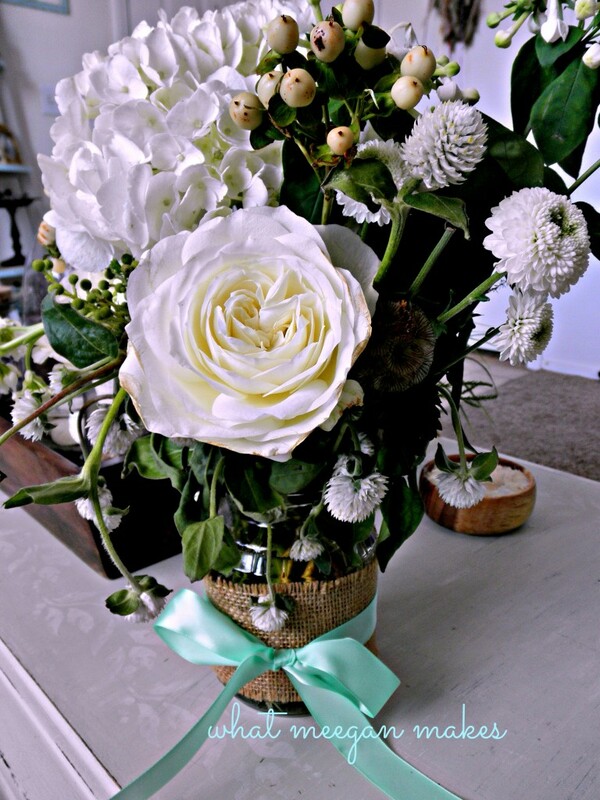 In these jars we have roses, yarrow, baby’s breath, dusty miller, berries, stock, and filler. One of the bridesmaids had these wooden disks for us to use, too. It was fun to play with them. They also added levels and texture. 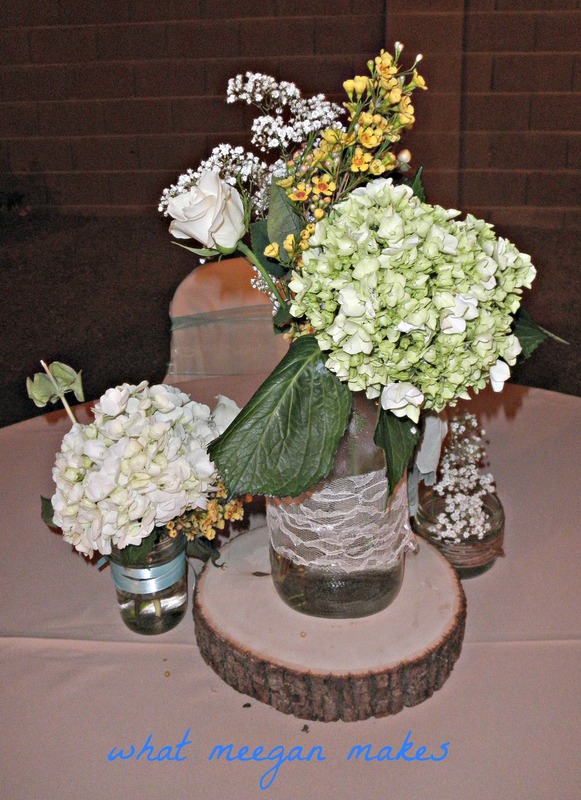 We basically used the same flowers as the above pictures, but they take on a whole new look with using the wooden disk. Some of the jars were wrapped with lace and ribbon. So simple and beautiful!! We bought some succulents to add to some of the bouquets, but then changed our minds. 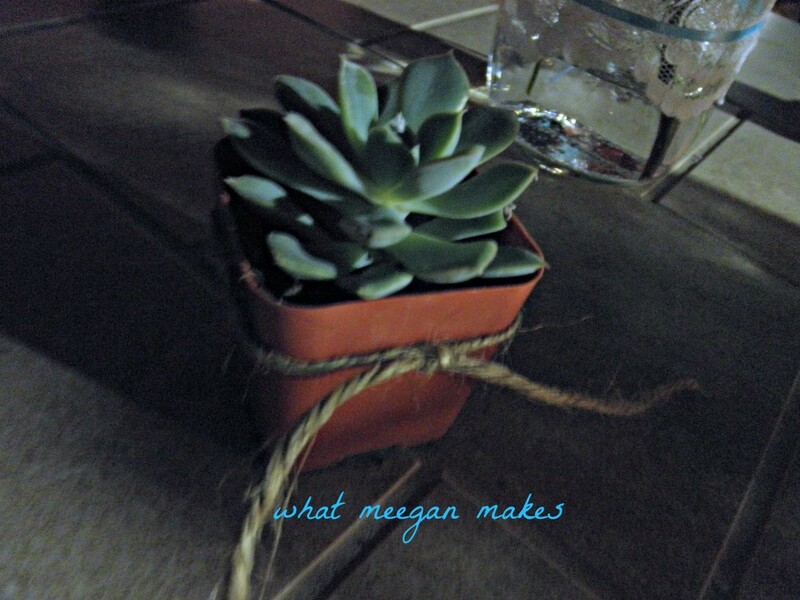 So I thought they would be cute tied with twine. People LOVED it!! So simple. Yet very effective. We had 13 shepherds hooks holding jars with wire, as lanterns. We placed a battery operated tea light in each one. 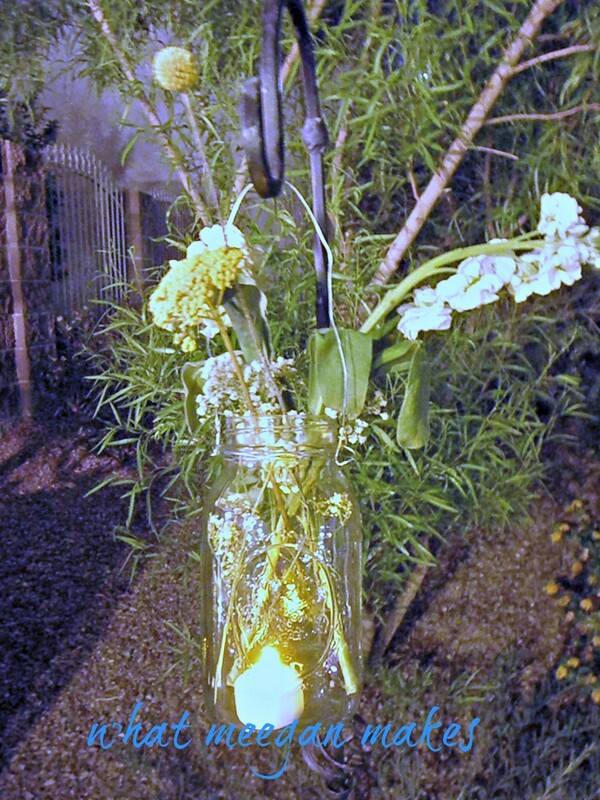 I thought it would look great with the real flowers in them the light the way, and look beautiful at the same time. Here’s another view of the shepherds hooks. Don’t you just love the doors?? So many ideas from this wedding. And this is probably my favorite spot. 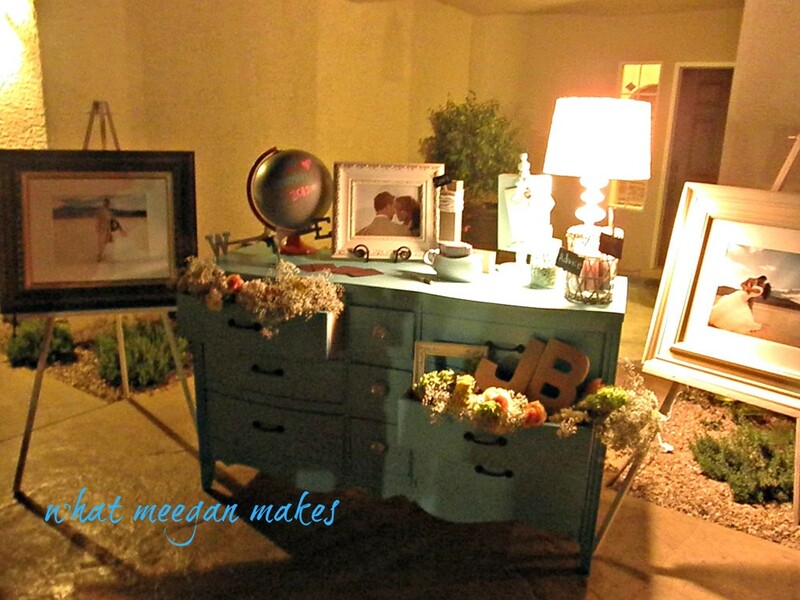 LOVE this dresser greeting all the guests. 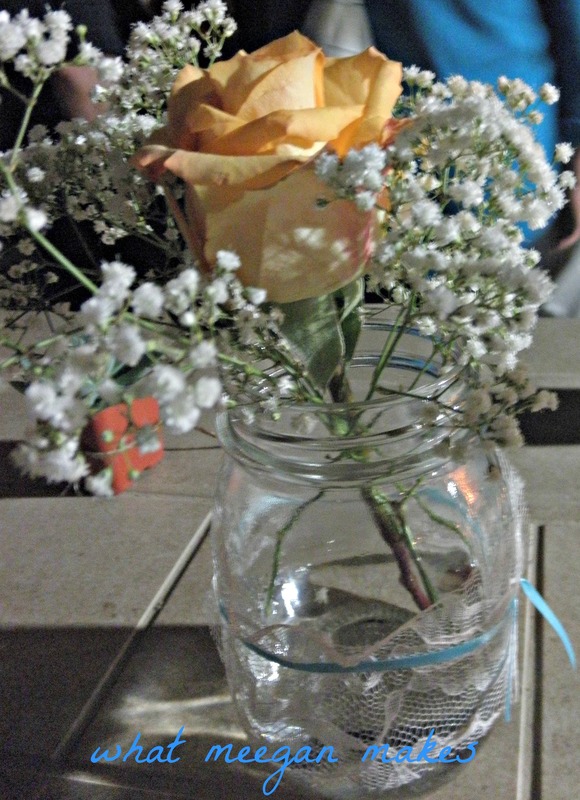 I filled it with as many flowers as I could. It was so fun. 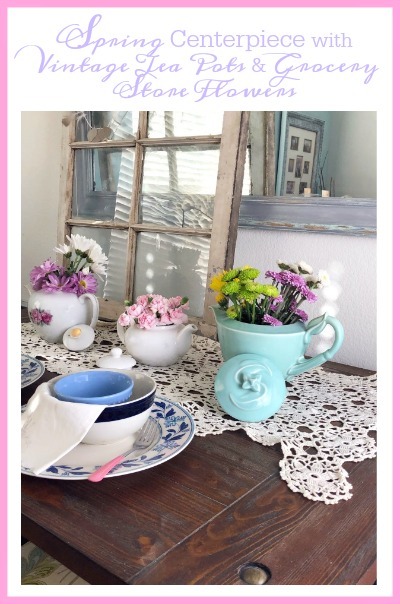 I hope you have gotten some ideas for simple ways to decorate with flowers. You don’t need to spend a lot. Just use your creativity. It is fun to step out of the box and use other flowers than you would normally see. 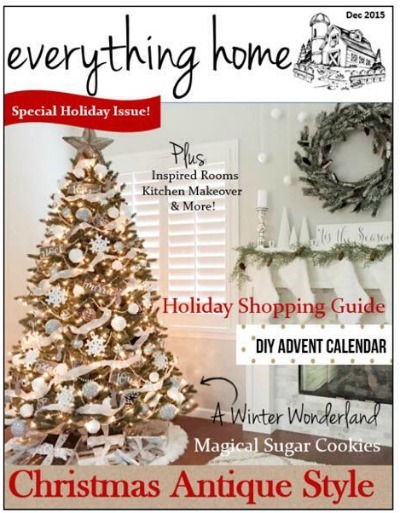 It is eye catching and definitely some your gusets will remember!! 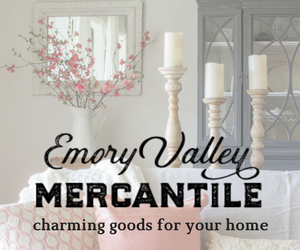 Are you following me on Pinterest, Facebook, Hometalk , Stumble Upon and Google+? It would be so fun to have you along with me there, too!! Make it a terrific Tuesday! !